Sarah Nader- snader@shawmedia.com Volunteer Moe Sergel of Belvidere walks a retired race horse at Anderson Home for Horses Saturday, January 23, 2016. The Marengo animal rescue is holding a fundraiser at the Main Street PourHouse in Woodstock Jan. 30. 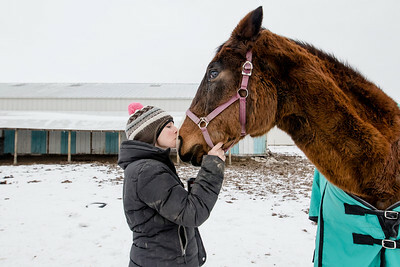 Sarah Nader- snader@shawmedia.com Jennifer Finkelman kisses a horse that was adopted through Anderson Home for Horses Saturday, January 23, 2016. The Marengo animal rescue is holding a fundraiser at the Main Street PourHouse in Woodstock Jan. 30. 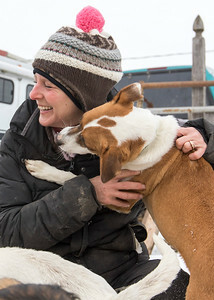 Sarah Nader- snader@shawmedia.com Jennifer Finkelman gets some love from rescued dog at the Glory Bound Rescue Ranch Saturday, January 23, 2016. The Marengo animal rescue is holding a fundraiser at the Main Street PourHouse in Woodstock Jan. 30. 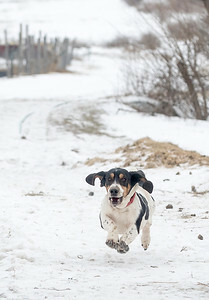 Sarah Nader- snader@shawmedia.com A rescued dog that is up for adoption runs around the Glory Bound Rescue Ranch in Marengo Saturday, January 23, 2016. The Marengo animal rescue is holding a fundraiser at the Main Street PourHouse in Woodstock Jan. 30. 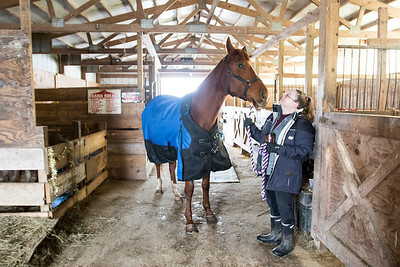 Sarah Nader- snader@shawmedia.com Katie Boss of Delavan, WI., picks up her foster horse from Anderson Home for Horses Saturday, January 23, 2016. The Marengo animal rescue is holding a fundraiser at the Main Street PourHouse in Woodstock Jan. 30. 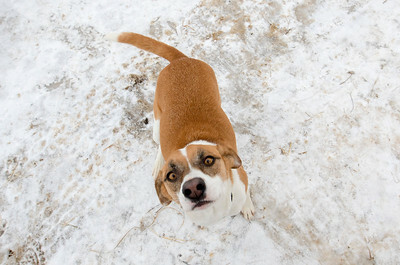 Sarah Nader- snader@shawmedia.com Deb Anderson is greeted by some rescued dogs that are up for adoption at the Glory Bound Rescue Ranch in Marengo Saturday, January 23, 2016. The Marengo animal rescue is holding a fundraiser at the Main Street PourHouse in Woodstock Jan. 30. Sarah Nader- snader@shawmedia.com Jennifer Finkelman walks a horse that was adopted through Anderson Home for Horses Saturday, January 23, 2016. The Marengo animal rescue is holding a fundraiser at the Main Street PourHouse in Woodstock Jan. 30. Sarah Nader- snader@shawmedia.com A rescued dog that is up for adoption runs around the Glory Bound Rescue Ranch Saturday, January 23, 2016. The Marengo animal rescue is holding a fundraiser at the Main Street PourHouse in Woodstock Jan. 30. 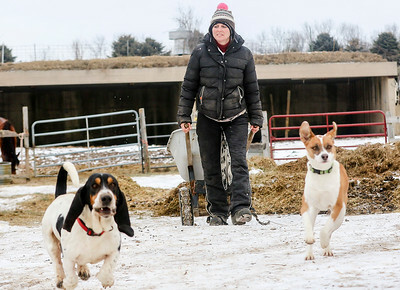 Sarah Nader- snader@shawmedia.com Jennifer Finkelman is followed around by some rescued dogs at the Glory Bound Rescue Ranch Saturday, January 23, 2016. The Marengo animal rescue is holding a fundraiser at the Main Street PourHouse in Woodstock Jan. 30. 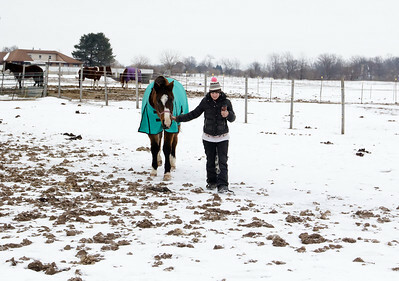 Katie Boss of Delavan, WI., picks up her foster horse from Anderson Home for Horses Saturday, January 23, 2016. The Marengo animal rescue is holding a fundraiser at the Main Street PourHouse in Woodstock Jan. 30.